At the time of the interview Charlotte was appearing as Tanya in Jez Butterworth’s multi-award winning play Jerusalem, at the Apollo Theatre. Having found her passion for acting and dancing while at primary school,Charlotte’s first formal training began at the Sheffield Crucible’s Youth Theatre. She then continued her theatrical studies for three years at The Oxford School of Drama. Charlotte made her professional stage debut in Jerusalem at the Royal Court Theatre, and followed this by appearing in the same play in the West End, then on Broadway, before returning to London at the Apollo Theatre. She has also performed as Barbara in Billy Liar, at the West Yorkshire Playhouse, Leeds, and Honoria Glossop in By Jeeves, at the Landor Theatre. Earlier this week Charlotte took some time out from her busy schedule to answer a few questions about herself and her career. When did you first discover that you had a talent for performing? I always had much more passion for out of school extra-curricular activities when I was a child. I seemed to excel more doing acting and dancing lessons and performance so it just seemed inevitable that I would follow a career as an actor. You first became involved in performing arts with the Sheffield Crucible’s Youth Theatre. How would you describe your time there? The Crucible Youth Theatre was really the place where I felt at home as a teenager. I found it so thrilling getting to go into a working theatre every week for workshops with like-minded peers. It was there that it was confirmed to me that I had to work within a theatre when I grew up, as it just felt like such a magical place to work. You trained at The Oxford School of Drama. What are some your favourite memories from then? I had an incredible 3 years at the Oxford School of Drama. It was such an exciting and immersive training. It only takes a small amount of actors a year (18 in each class) so you get such a personal training because you know everyone and there is nowhere to hide in a crowd. I loved this because it really pushes you to excel and work hard throughout the 3 years and therefore be fully prepared to work. How did it feel making your stage debut in Jerusalem at The Royal Court Theatre? I was over the moon when I first found out I had got Jerusalem. I have always loved going to The Royal Court and admired the work they put on and the people who work there, so I couldn’t believe I was getting a chance to be in a play there, and then add into that getting to work with Ian Rickson, Jez Butterworth and Mark Rylance; it really was a dream job. Billy Liar is set in Yorkshire and you performed as Barbara at the West Yorkshire Playhouse, Leeds. What was it like with a ‘local’ audience to that of the storyline? Billy Liar is such a great play and so strongly set in the late 1950’s in Leeds so it was lovely to be able to present it to the local audience in Leeds. It was so gorgeously directed by Nick Bagnall. Because of this we had so many people coming up to us saying that they knew the people on stage and that the set looked exactly like their Nana’s house. It was nice to have people wanting to come and talk to us about the play and their memories of that time. 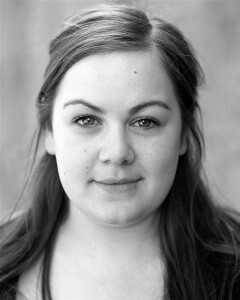 You played Honoria Glossop in By Jeeves, alongside Paul Meston and Kevin Trainor at the Landor Theatre. Singing, dancing and comedy, is this the type of role that you really like? I went to dancing lessons all the way through my childhood and always enjoyed singing, but once I decided I wanted to go down the route of straight acting I didn’t do much other than the few lessons we did at drama school. I have always wanted to give doing a musical a go so when Nick Bagnall who directed Billy Liar asked me to come and audition for By Jeeves I jumped at the chance. It was perfect, as Honoria is a character based part, so I could really get into her eccentricities. During rehearsals I really enjoyed dusting off my now slightly small tap shoes. It surprisingly all came back to me very quickly even though I hadn’t had a tap lesson for 9 years. I certainly would like to try my hand at another musical in the future. Can you tell me about The 24 Hour Plays at The Old Vic, which you took part in? It was a crazy experience to be part of. I have never been so nervous as I was when I was about to step out on the Old Vic stage and perform a play that I had only seen eight hours previously, in front of 1100 people. But once we had all done it there was such an immediate feeling of achievement I felt that I could do anything once I had done that. You are currently performing as Tanya in Jerusalem, which has also played at The Royal Court Theatre, The Music Box Theatre on Broadway and now again at The Apollo Theatre in the West End. How does the Broadway audience compare to that of London? We were really nervous opening on Broadway after the amazing response we had at home in London. We weren’t sure if an American audience would understand and relate to the play and whether they would indeed find it funny. But we realised at the base of the play it is all about defiance and that theme translates perfectly over to any country. I think they needed to work harder as an audience in America to keep up with the language, but they all seemed so up for having to work slightly and because of that everything that landed here in London also landed much the same in New York. It was so thrilling to meet people at the stage door who came to see the show multiple times; they seemed to get transfixed by this image of England that Americans never see. What makes Jerusalem so successful? I think because Jerusalem is such an epic piece of theatre that smacks you in the face, it deals with big ideas and mythical tales that seem almost Shakespearian, and because of this I think an audience feel they have really experienced something larger than life when they come and watch it. As I previously said the play is all about being defiant and I think everyone has that feeling within them. Also, obviously Mark Rylance is astounding as Rooster Byron, Jez Butterworth has written an incredible play, Ian Rickson has directed the play beautifully and the company are such a happy bunch so I think that also helps with the success that has come. How would you describe Tanya? Tanya is a local feisty teenage girl who lives in the small village of Flintock in Wiltshire, it’s a very small and sleepy place with not much going on. Because of this the local kids gravitate to Rooster Byron’s caravan in the woods. Tanya follows where the fun is and is also a romantic who is in love with local lad Lee, but unfortunately he is leaving to go to Australia the next day so Tanya puts all of her efforts into wooing him. What do you like to do on your days off from the stage? Catch up with friends over a coffee or a bite to eat. Sit on my sofa with a cup of tea watching trash television I have recorded over the week. Wander the streets of London for hours listening to music on my headphones. Going to the Theatre and Cinema. Riding my bike. A few quick-fire questions for you! Public Transport or Taxi? Public transport day to day, taxi for a treat. Wine or Fruit juice? Wine. Mars Bar or Hot Chocolate? Hot Chocolate. With chips: salt ‘n vinegar or ketchup? Chips with just salt. Thank you Charlotte for giving us an insight into yourself and your career.